Chinese is an awesome language. It definitely stands out from the usual Romance languages, and the characters just look so cool! Plus, if Mark Zuckerberg is learning the language, even more reason to hop on board, right? But let’s face it, learning Chinese is not a piece of cake. It requires a lot of hard studying. If you aren’t enrolled in a Chinese language program but still want to learn it, don’t be afraid to dive in and learn Mandarin Chinese on your own at home! The following five tips will make it easier for you to learn Chinese without leaving your house! Now how’s that for comfort? Yes, we are starting with a plan, and here’s why: Ever made a New Year’s resolution but didn’t keep it? Yeah, most of us have done that. If you don’t have a concrete goal, how will you reach it? That’s why before even starting to learn Chinese at home, you should determine your goal. On paper. If you have the goal right in front of you, it’s much easier to achieve it. First, think about what you want to achieve: What exactly is your goal? Better pronunciation? Mastering more vocabulary? Being able to flawlessly write 500 Chinese characters? Or do you simply want to finish a certain textbook by Christmas? Once you think about what you really want, it’s much easier to stay on track. The most important tip when making your study plan is to keep it realistic. Nothing is worse than expecting too much and not coming close to it. It’s frustrating and it will keep you from progressing. For example, it’s likely impossible to finish a textbook in a month if schools usually spend an entire year with the text. However, there are study plans without an actual goal! The aim here is to continuously study the language for the longterm to build your language knowledge. A study plan doesn’t have to be boring! Add in fun activities such as watching one Chinese TV show or one movie each week, or reading a Chinese newspaper every other day for 10 minutes at a time. Studying is not just reading textbooks and writing vocabulary! Once you have everything down on paper, make sure to hang up the plan somewhere you’ll see it every day. This is really important! Before sticking it on your fridge or taping it to the wall, you could also add little checkboxes on the plan to more easily measure your progress. So remember, if you want to learn Chinese like a pro, start with a specific study plan and stick to it. The four essential elements of the Chinese language are speaking, listening, reading and writing. Don’t make the mistake and neglect one over the other; they are equally important! However, you want to start easy and work your way up to stay encouraged and motivated. First, you need to practice your reading comprehension. 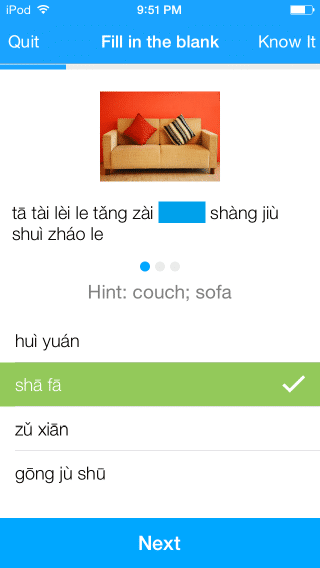 Here, you can either start with pinyin or tap right into characters depending on your Chinese level. There are two golden rules for practicing Chinese reading: Read aloud and read often! If the usual textbook stories are too boring for you, you might want to try and check out Chinese Reading Practice. This website is a great tool for practicing reading, since it offers different stories and texts at three levels: beginner, intermediate and advanced. 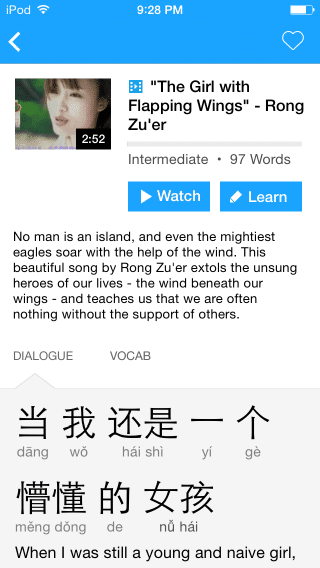 This resource even lets you swipe over vocabulary you don’t know and gives you the translation and pinyin! Make yourself a challenge to read for 10 minutes every day. It’s better to practice more frequently for a few minutes than just once or twice for a long period of time. Once you build yourself a certain vocabulary base, practice listening. Don’t only listen to textbook conversations on audio CD, though! How about Chinese songs? Besides music, try watching Chinese dramas or movies! Drama Fever has a great selection of movies and shows from China with English subtitles. A unique and fantastic way to practice listening is with FluentU. FluentU takes real-world videos—like music videos, movie trailers, news and inspiring talks—and turns them into personalized Chinese learning lessons. The hand-selected authentic video clips are subtitled and translated, and each word is accompanied with an in-context definition, image and multiple example sentences. You can even click on a word to see how it’s used in other videos across the site. And the entertaining real-world context makes new words so much easier to remember! Writing is one of trickiest parts of Chinese for me, personally. Chinese characters are indeed complex, but not impossible to learn! Why don’t you try and spice up character learning with a little calligraphy lesson? Check out free calligraphy lessons online at Art Virtue. Try to enjoy calligraphy in your free time or after practicing Chinese, paint some newly learned words! That way you will automatically save them in your memory; they’ll stick much better since you put effort and passion into your art. Practicing speaking skills at home is rather difficult but not impossible. A great way to improve your speaking skills at home is to find an online language partner. And a wonderful resource to find real native speakers with the same intentions as you—practicing language—is italki. Get free language practice by exchanging your time teaching your native language for time learning a foreign language. Set up a weekly routine with your language partner. If you practice Chinese with someone once a week, you will see improvements in no time! Also, try to connect with multiple native speakers of different regions. This gives you insight in different dialects and accents of Chinese. If you have a little extra cash to invest in a professional Chinese tutor, you can find one of these guys on italki too. This is a great way to focus 100% on Chinese, get personalized feedback and speed up your progress. Studying at home isn’t always easy, but there are books especially made for self study, covering all of your needs. My all-time favorite is this basic book for conversational Chinese, “Chinese for Beginners: Mastering Conversational Chinese.” It’s well-written and helps you speak Chinese in no time. With “Complete Mandarin Chinese,” a “Teach Yourself” book, you’ll be able to both understand the culture and speak the language. This book teaches Chinese in a modern, structured and engaging way, which is really easy to follow by yourself. One of my most effective Chinese study tools are simple sticky notes. This might seem like an old trick to you, but it’s super useful and made me memorize a lot of vocabulary in a short amount of time. Write the Chinese word on a sticky note. Start with things you can find in your house: table, bed, lamp, fridge, etc. and hang the notes on the corresponding item. Every day, you will walk past it and read it until you remember the word. Caution: This only works if you rearrange the sticky notes after about a week. If you don’t change their position, you will get used to them and won’t pay attention to them anymore! Make sure to use different colors of sticky notes depending on type of speech. For example: blue for nouns, green for verbs, yellow for adverbs and red for adjectives. That way, you will also memorize how to use the word in a sentence. 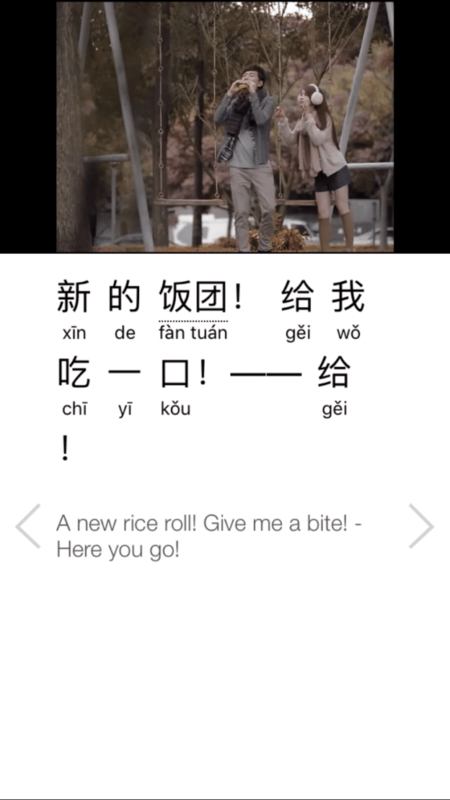 The Chinese-language set from Vocabulary Stickers is a great way to get started. It covers many of the most common items you’ll find at home and in your office. The stickers are color-coded by tone and super durable, so they’re great for kicking off your labeling project. There also is a great method for abstract words that can’t be found in your room: Create your own language tree and make leaves with different sticky notes. Place words you find hard to remember at the bottom of the tree and easier words upwards, moving words around as you learn them. Once a vocabulary word reaches the top of the tree, it should be in your longterm memory, and you can fill the bottom with new words! There are a lot of shows, movies and songs out there to watch—so use them! If you want to go get the most out of these types of media, try to write down words you hear but don’t know and look them up later. Don’t write down every single unfamiliar word, but just a few—maybe ten per movie/show. You could also try to force yourself to pay closer attention to the movie or song by searching for familiar words. For example, try to listen for “mama” during a movie and count how many times you heard it! You will start to notice how many more words you actually understand. As I’ve mentioned throughout, always try to keep your studies interesting and entertaining by using different and fun tools. Along with movies, TV shows, newspapers, games, FluentU and music, you can also use interesting books to learn Chinese at home. One such book I recently purchased is “Illustrated Chinese Buzzwords,” which features 50 colloquial and slang words that everyone who speaks Chinese needs to know! You could also find an online Chinese conversation partner, include the holidays in your language studies, make a collage of Chinese characters and magazine pictures or add some fun apps to your phone or tablet—just to name a few ideas. The worst you could do is to sit at your desk for hours at a time reading your Chinese textbook. While you can benefit from referencing a textbook, you’ve got to mix it up and keep your study activities fun and varied to learn Chinese like a pro. Finally, making the study plan was a huge step in the right direction, but how will you be sure that your methods are working? How can you know if you’ve improved your Chinese? This is why you need to measure your progress. Every textbook should have a “test” or “repeat” section where you can test your progress. If not, you could also try to take HSK mock tests as guidelines, which can be really helpful. Don’t be afraid to think outside the box with this tip, too. How about recording a video of yourself speaking Chinese once a month? If you like the idea of visually seeing your progress, you could even track it daily—for 100 days—with the site and supportive community at Give it 100. Another option is to keep track of how many FluentU videos or words you have mastered, or how many songs you know the lyrics to. Find a tracking method that works best for you, and use it regularly to measure your progress. And there you have it! 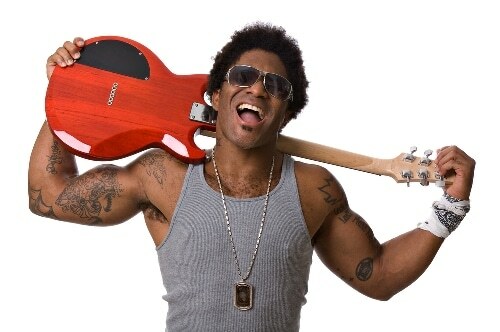 Stick to these five tips, and you’ll be well on your way to rockstar success in learning Chinese at home. Good luck! Now we’ll show you in a little more detail what FluentU is really all about.